August 10, 2016, Parsippany, NJ – The U.S. Department of Health and Human Services announced last week that they no longer recommend daily flossing as part of basic oral hygiene practices. This decision is the result of a lack of scientific evidence that confirms flossing helps to improve oral health. But the declaration has one Parsippany dentist, Dr. Alan Rauchberg, speaking out with a strong difference of opinion. “My staff and I have always encouraged our patients to floss daily and we will continue to do so despite this recent announcement,” says Dr. Rauchberg, owner of the Rauchberg Dental Group in Parsippany and president of the American Academy of Dental Practice (AADPA). 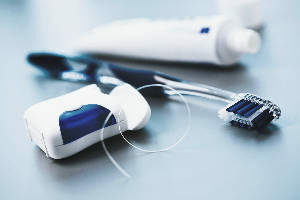 “Studies have shown that regular flossing can help prevent tooth decay and gum disease – conditions that have been linked to heart disease and Alzheimer’s.” Dr. Rauchberg also explains that flossing not only helps to remove the food particles that get stuck between teeth, but the flossing motion also creates air pockets within the tight spaces between teeth which help kill cavity-causing bacteria. According to the American Dental Association (ADA), flossing regularly has been proven to prevent plaque buildup, gingivitis and tooth decay, all which can lead to periodontal (gum) disease. Despite these findings, the ADA reports that only four out of ten Americans floss at least once a day, and 20 percent don’t floss at all. “Of course we want more people to take flossing seriously,” says Dr. Rauchberg, who educates his patients about the ‘big 3’ when it comes to good oral health: daily brushing of the teeth and tongue; daily flossing between teeth; and visiting the dentist twice a year. Unfortunately, Dr. Rauchberg is concerned that the U.S. Department of Health and Human Services’ announcement could have an impact on the already low percentage of people who do include flossing in their daily oral regimen.